In reading the Facebook group pages and the web forums that are dedicated to cruising, I’ve come to realize that many people are confused about phone, Internet and wi-fi communications on board a ship because they don’t understand the basics of how networking technology works. That’s no surprise, since most people aren’t in the tech industry. So I felt almost obligated – as a technology writer and an avid cruiser – to write an article explaining (with as little jargon and geekspeak as possible) what you can and can’t do out on the sea, and why, and how, and how much it’s likely to cost you. Since this is primarily for people who aren’t technical at all, I’ll start with a brief primer on how smart phones work. We’re all familiar with the cellular voice networks, which have been around for a long time. But many don’t understand how data is sent over cell phones, and when they’re using the cellular company’s network and when they’re not. Basically, you have three types of communications that operate over your carrier’s network: voice calls, text messages (SMS) and data services (Internet connection). Whenever you use the carrier’s network for any of these, they charge you. However, there are two very different ways you can connect to the Internet with a smart phone. You can use the carrier’s data network (usually 3G or 4G), or you can use the phone’s wi-fi radio to connect to some other network that has an Internet connection (more on how that works later). When you use wi-fi, you don’t have to pay your cellular company for the Internet usage. A smart phone has several different “radios” (transceivers) built in. It has the one that connects to the cellular networks. This works long range and connects to cell towers that can be miles away. It has a wi-fi radio that works over a more limited range (a few hundred feet) and connects to wireless access points (WAPs). It probably has a Bluetooth radio that only reaches about 30 feet and can be used to connect to another device (such as another phone or laptop) that’s nearby or to a peripheral device such as a keyboard or headset. It might also have an NFC (near field communications) radio that has a very short range (a few inches) and can be used to communicate with readers (for example, to make electronic payments at stores) or transfer data to and from other NFC-enabled phones by holding them very close together. Almost all mobile devices have a setting called “Airplane mode.” This works just as well at sea level as it does at 30,000 feet. When you put your phone in “Airplane mode,” it turns off all the radios. 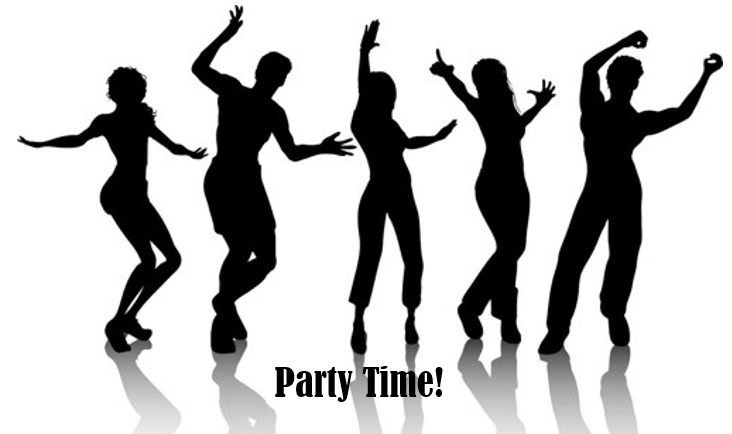 However, you can turn wi-fi back on without turning on the cellular data radio. As long as the latter is turned off, you don’t have to worry about getting charged by your cell phone company. This is important because cell phone carriers often charge exorbitant rates for roaming voice and data services. That is, when you get outside of their coverage networks (such as when you go outside the U.S. on a cruise), those extra charges kick in. With voice calls, this doesn’t matter so much because you can just not make or answer any calls if the phone indicates it’s roaming (which it generally does by a special icon in the notification bar, and some carriers also pop up a message to let you know). With data, though, some apps will automatically use data without you doing anything. For example, if you have your email app set to “push” mail, it will download every message that comes in. Or if you have Facebook open, it will refresh itself periodically and download the new updates (which can include photos and videos with large file sizes that shoot your roaming data charges through the roof). Roaming data charges can easily extend into the hundreds of dollars. The first time my husband went to Israel after getting a smart phone, he thought nothing of using it to check his email. Our next Verizon bill was $600 more than usual due to the roaming data charges. That’s why you should always turn off mobile data when you’re leaving the country. You can do this simply with the “Airplane mode” setting, or if you want to keep voice and wi-fi on, you can turn it off selectively in your phone’s settings. However, this is often buried deep in the Settings. On Galaxy phones, it’s under “Wireless and Networks –> More Settings –> Mobile Networks. Since it costs nothing to use your wi-fi radio, that’s your best (or at least, your cheapest) bet for communicating with your phone when you’re at sea – or any time you’re traveling internationally, for that matter. You can even use wi-fi to make voice calls (video, too, if your Internet connection is good enough) if you have an app designed for that purpose, instead of calling over your cellular carrier’s voice network. Important: Be aware that some cellular providers will charge you for using these apps, which are called Voice over IP or VoIP apps, as if you were using cellular minutes – if you have the cellular radios turned on. You also have to pay Skype to make phone calls to regular phone lines or to receive Skype calls on a Skype phone number. Skype-to-Skype calls (calling someone else who also has Skype) are free but if you’re using the cell phone carrier’s Internet connection (3G/4G), you will of course have to pay for that. 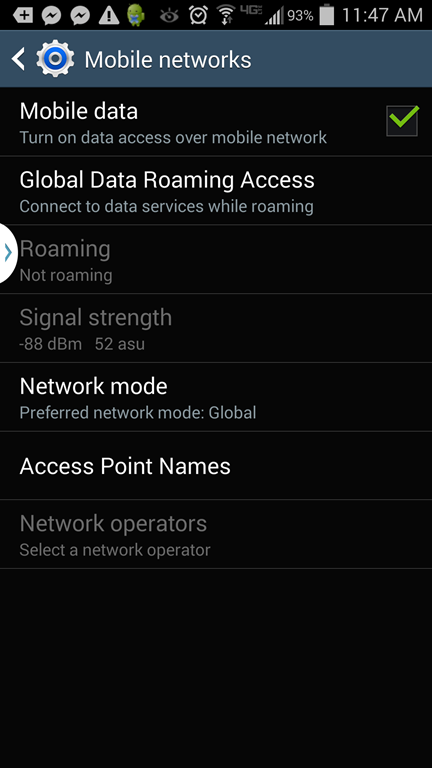 Again, turn mobile data off and/or disable data roaming. Much of the confusion associated with wi-fi stems from the language used by providers to market their products and services. People think they are “buying wi-fi service” when in fact what they’re buying is an Internet service, which they happen to be connecting to over a wi-fi signal. Wi-fi (at least in the context of shipboard communications – there is also something called WiMax but we won’t talk about that here) is a local networking technology. That means it has a relatively short range – a few hundred feet. You can set up a wi-fi network anywhere. All it takes is two devices that have wi-fi transceivers (transmitters and receivers) and antennae built in. Two computers with wi-fi network adapters can send and receive wi-fi signals to/from each other as long as they’re within the distance range. That’s called an ad hoc wireless network. You don’t have to pay a service provider to be able to do this. You just need software that supports ad hoc networking. It costs nothing. On board a ship, you can set up one of these ad hoc networks between two wi-fi devices and they can communicate with each other, although the metal walls of the ship may interfere with the signal somewhat (depending on the strength of your wi-fi antennae). You’ll need an operating system with the capability of creating an ad hoc network, such as Windows 7/8, or an app for your smartphone or tablet that can do this, such as Ripple. You can also set up your phone as a wi-fi hotspot using an App like PDAnet or FoxFi, and another wi-fi device can connect to it and either use its Internet connection (for example, if you purchased an onboard Internet package) or just communicate directly with it, without Internet. 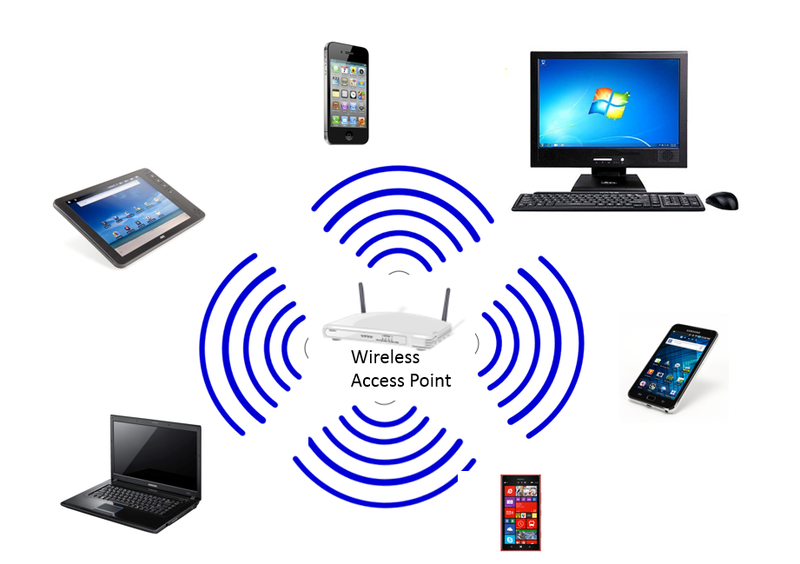 If you want many different computers to communicate with each other over wi-fi, you usually set up a wireless access point (WAP). All the communications go through it and all the wi-fi enabled computers, tablets and smart phones can send and receive data amongst themselves. It’s pretty simple. Now here’s where it gets a little more complicated. The wireless access point creates the local network. But the WAP can also be connected to another network, such as the Internet. 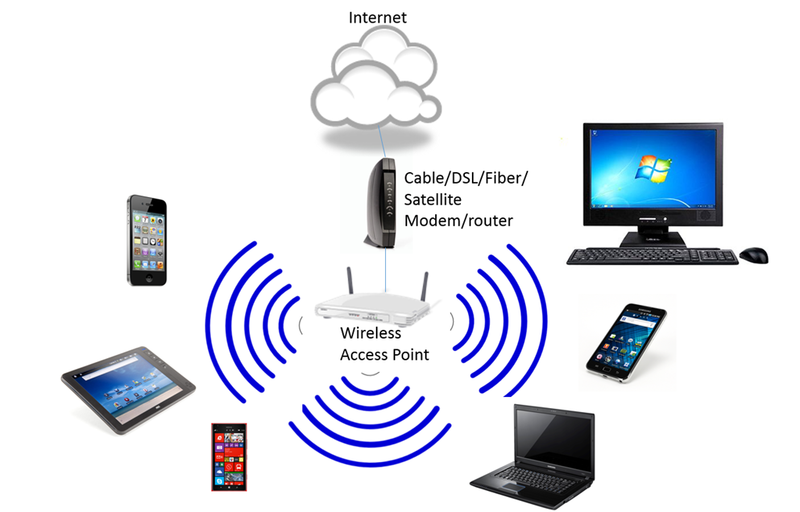 When you connect the WAP to the Internet, the devices that connect to the WAP can all share that Internet connection. Most “public” wi-fi networks are connected to the Internet. That includes airport hotspots, in-flight airline wi-fi, hotel networks and the local wi-fi network on a cruise ship. Many/most of the companies that set up these wi-fi networks that are connected to the Internet configure them to block the Internet connectivity to anyone who doesn’t have a password. Then they charge you an access fee to get a password. Fees can range from $5-15 for the duration of a flight to $10-30/day in hotels to the per-minute charges that most cruise lines are currently using. You won’t be able to view web sites, get email or use any other applications that depend on the Internet without paying. 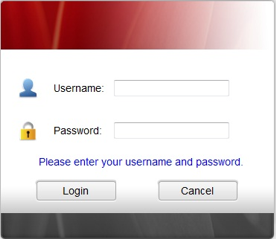 However, you can log onto the local network without paying. You have to be able to, in order to get to the local web server (which is on the premises, not somewhere out there on the Internet). The local web server is what displays the page that you use to buy an Internet package. While you’re logged onto just that local network, there’s still a lot you can do (at no cost). On a Carnival ship, you can visit the Carnival.com web sites. You can book another cruise (although I’d recommend doing it at the Future Cruise Desk instead, to get the on-board credit), you can read the Funville forums, and you can even communicate with people back home by posting messages in those forums. Since they aren’t on the ship’s local network, they have to have an Internet connection to access the forums. If you want to be able to “get out” to the Internet, you have to log onto the local web server to get to that web page where you enter your credit card info to pay for the Internet access. That’s why accessing the ship’s Internet connection is a two-step process. 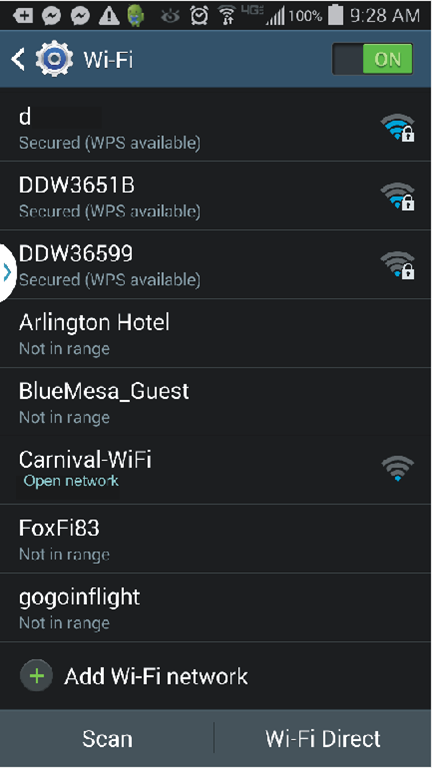 First you have to go into your device’s wi-fi settings and tell it to connect to (for example) the Carnival-Wi-Fi network. This is an open network, which means you don’t have to have a password to connect to it (unlike a secured network). At this point, you are only connected to the local network, which is also called the intranet. The only web pages you can view are those on Carnival.com’s servers. 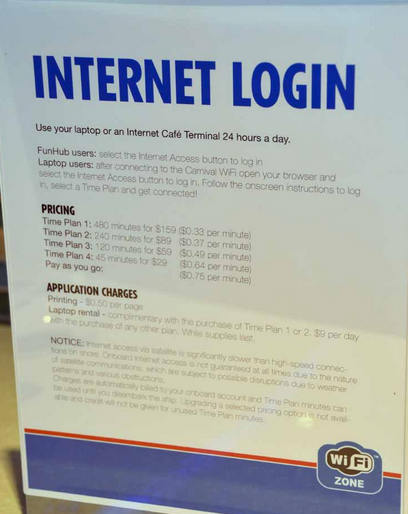 When you buy an Internet package, then the system assigns you a username and password (which will be your folio number that’s on your Sail & Sign card and your date of birth) and entering that information allows you to access the ship’s Internet connection. But that Internet connection is probably a little different from the one you have back at home (unless you live in a rural area). Practically speaking, the big difference is the speed. If you have a wireless network at home, it’s probably connected to a DSL, cable or fiber optic “modem” that brings the signal to your home over wires of some sort. Obviously you can’t hook up a wired connection to a ship at sea, so it has to use a satellite transceiver to send and receive the signal. 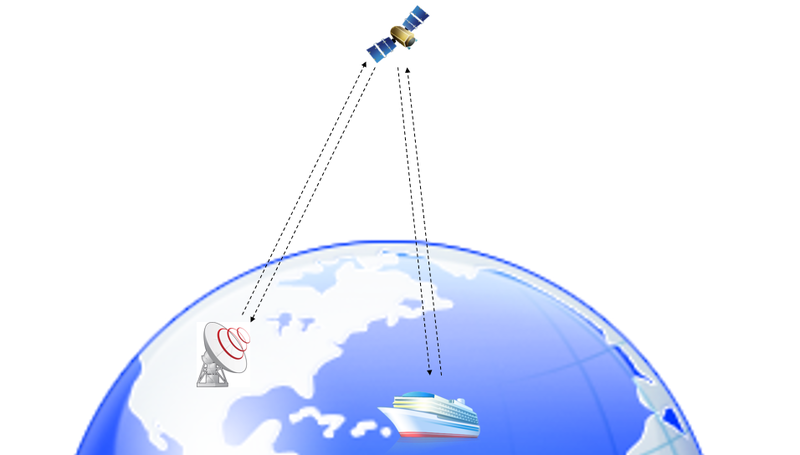 To connect to something out there on the Internet via satellite, first your computer, tablet or phone has to send the data to the ship’s wi-fi network, then that network passes it to a satellite transceiver on the ship, which beams it up to a satellite in geosynchronous orbit, which beams it back down to the satellite transceiver of an Internet provider back on land, which then sends it to the server on the Internet where that web page, email account or other resource is actually stored. That means your data (such as the request for a web page when you type an address into your browser) has to travel a little over 22,000 miles from the ship up to the satellite and then the same distance down from the satellite to the earth. Then when the web server returns that page to your browser for you view, it has to make that same trip again in reverse. What this means is that the ship’s Internet will likely never be as fast as land-based broadband. But the good news is that satellite technology is getting better (and less expensive) over time. There are new satellite technologies available now, and cruise lines are investing in more modern, better equipment. And there’s a way to speed up that process – through the simple economies of scale that come with increased demand. We’ve seen that play out before. Back in the late 1980s, I paid $25 an hour to get online at home, with a 2400 baud per second modem. That means its speed was 2400 bits per second. By comparison, a 10 Mbps connection like many cable companies now offer is equal to 10 million bits per second. Fast forward two decades and a fast, unlimited Internet connection can be had for $50 per month or less – the cost of just two hours online back then. Why is it so much cheaper now? In part because back in the ‘80s, there were very few people using the Internet (or who even knew what it was). As more and more got online, connectivity became a commodity and prices dropped. Cruises have traditionally been and to some degree still are (especially on lines other than Carnival) comprised of a somewhat older demographic. Once upon a time, only those at or near retirement age had the time and money to cruise. Carnival played a big role in changing that. They made cruises more affordable and set out to attract a younger set with their “fun ship” marketing approach. In the meantime, computing devices and the Internet have become an integral part of many people’s lives. Connectivity is almost ubiquitous. We have a generation that has grown up using computers, that takes for granted being able to get online no matter where and when. While their older counterparts often cite “getting away from it all” and “unplugging from phones and Internet” as part of the attraction of cruising, today’s young people (and some of us old folks who are on the geekier side) want to have all the fun of being at sea without being cut off from friends back home and across the world. As more and more of these “digital natives” take up cruising, reasonably fast, reasonably priced (though never as fast and cheap as land-based) Internet service will be something cruise lines will have to offer in order to stay competitive. We’ve all heard the old saw “use it or lose it.” If too few people buy Internet packages on cruises, the cruise line won’t make enough revenue to make it worth it. If lots and lots of people buy Internet packages, the cruise line will see it as a new important revenue stream and look for ways to make it better so they can attract more business. One last note for those of you who don’t want to be bothered by the Internet while you’re on a cruise: there’s a simple solution. Don’t buy the package. But please don’t tell the cruise lines they shouldn’t offer it, and please don’t lecture those of us who want to (or must, for work or personal reasons) stay connected about what we “should” do on our vacations. The whole point of a vacation is to do what makes you happy, as long as it doesn’t hurt anyone else. And my spending time taking care of work email or sharing the good time I’m having with my Facebook friends doesn’t. If you’re interested in reading more about technology, be sure to check out my Deb Shinder’s Technology InSights blog. thank you information is a pearl of wisdom!!!! Very good article Debra! My guess is that in the next 10 years cruiselines will have to offer free internet, otherwise the younger generations will refuse to board the ships!